Has anyone in your PR team realised yet the irony of your involvement in Red Nose Day? The need for you to focus on changing direction (welfare reform, plans for growth, austerity, bank bonuses) as opposed to One Direction, for example? 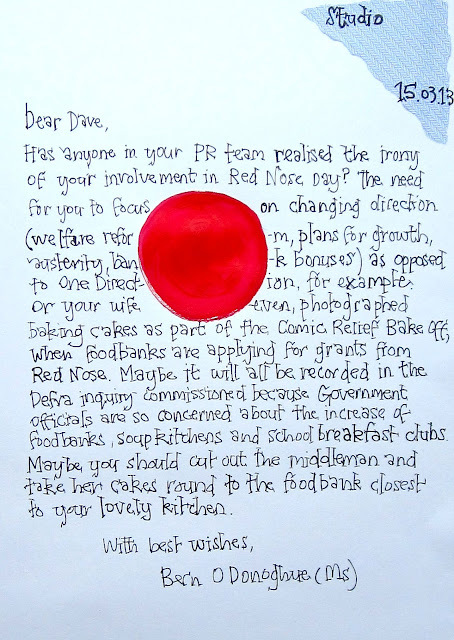 Or your wife even, photographed baking cakes as part of the Comic Relief Bake Off, when food banks are applying for grants from Red Nose. Maybe it will all be recorded in the Defra inquiry commissioned because Government officials are so concerned about the increase of food banks, soup kitchens and school breakfast clubs. Maybe you should cut out the middleman and take her cakes round to the food bank closest to your lovely kitchen.